COMEDY. Intrepid student detective Sam Archer has just solved his most recent case—locating a lost term paper. 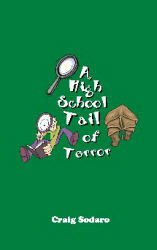 Now Sam has been called on to solve the case of “Operation Tall Tail.” After a cold-hearted thief steals Rhineburger High School’s most-prized artifact, Rocky the rhino’s tail, Sam finds himself on the trail of a tail. If Sam doesn’t find the missing rhino tail before prom night, his school will lose out on a million-dollar donation to build a new gym. As the clock ticks down, the suspense heightens as Sam has to decide who to take to prom, a task that may prove more difficult than finding Rocky’s tail!